It's like a one-cookie party! First I had to get an appropriate cookie cutter. I went to a well-known cooking store but was disappointed in the option they sold – flimsy-looking, with a too-narrow stem in the design (it would definitely burn/fall apart) and no handle. I ended up turning to Etsy and finding a lovely handmade cutter (I picked up a teacup cutter too). My friend had included an example of someone else’s attempt at Margarita cookies, which had simply been sugar cookies flavored with orange zest – no lime to be seen! 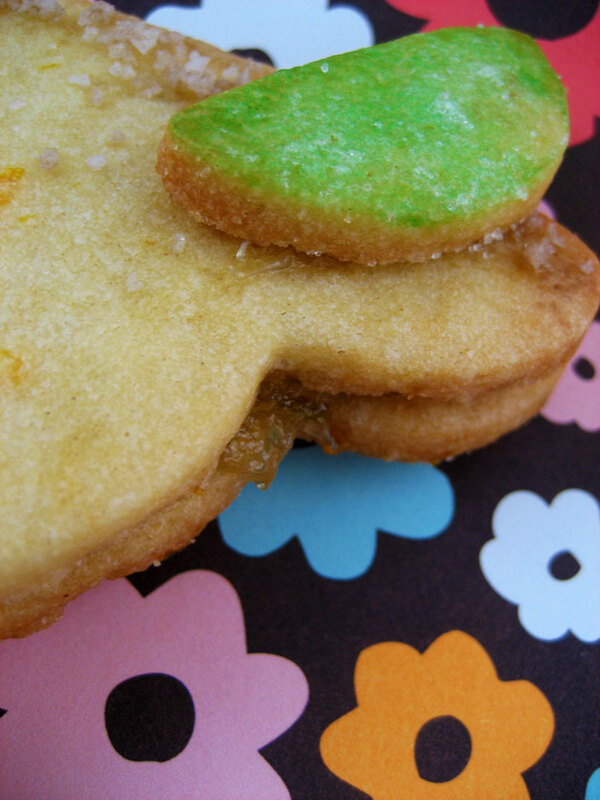 However I did like the idea of a nice orangey sugar cookie, so I kept that element, using Dorie‘s sugar cookie recipe. Since all good Margaritas must have a nice, salty rim, I incorporated that by brushing the “rim” of the cookies with agave nectar (because it’s the tequila plant) and affixing large crystals of Bali smoked coconut-lime salt that my mom had sent me. Finally, because you REALLY can’t have a Margarita without bitter, tangy lime, I decided to make sandwiches with the cookies, sticking them together with homemade lime marmalade. Green, sticky, bitter...and absolutely perfect. These cookies were pretty awesome. 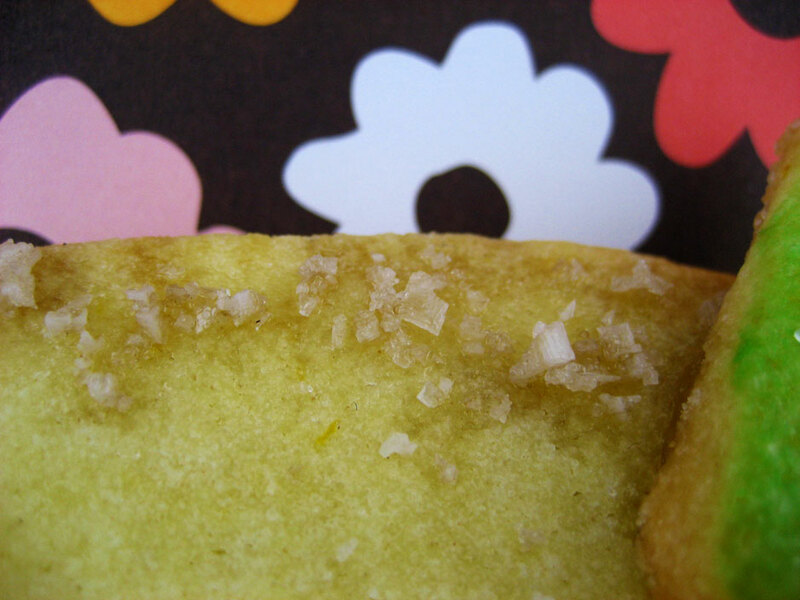 The sugar cookies bake up very crisp, almost crackery, but after they’re sandwiched and have a night or so to sit in the fridge, they soften and the lime flavor permeates both cookies, creating a really limetastical treat. Wash and slice the limes. Roughly puree them, leaving some chunks of skin intact. Place the puree and the water into a small saucepan and cover. Simmer for 30 minutes. Uncover and add the sugar and salt. Bring to a boil and allow to boil for at least 5 minutes, then test a small amount of the marmalade on a chilled white plate, letting it sit for a minute and then poking it. If it acts like jam (not watery, wrinkles when poked) then it’s done; if not, boil for another 5 minutes and try again, repeating until it’s perfect. 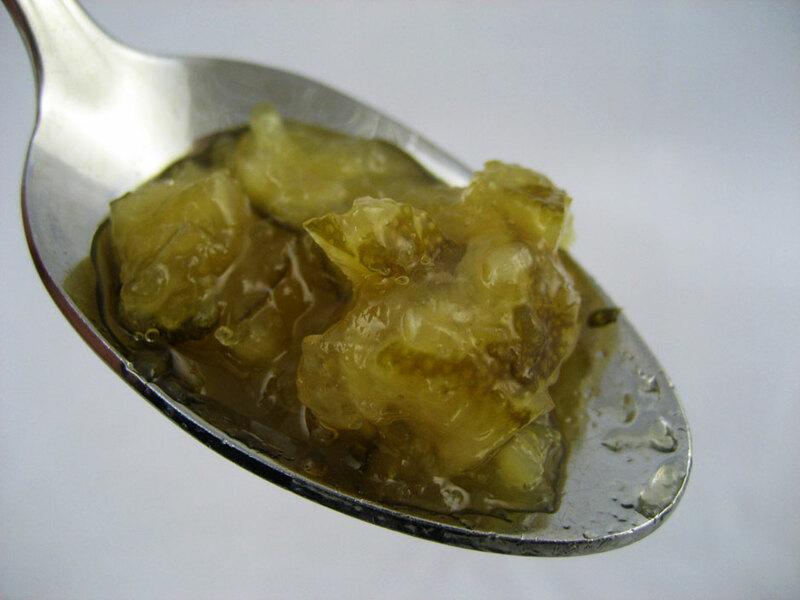 Transfer to a glass jar, Pyrex container or restaurant-quality plastic quart container, allow to cool slightly, then refrigerate until chilled. Cover for storage. Sift together the flour, salt and baking powder, set aside. Cream the butter with the sugar and orange zest. Once light and fluffy, add the egg, yolk and vanilla and beat until combined and emulsified. Gradually beat in the flour on low speed, being careful not to overmix it. Divide the dough in half and pat into discs. Wrap tightly and refrigerate for at least 2 hours. When ready to bake, preheat the oven to 350F. Roll the discs out one at a time, to about 1/4″ thick. Chill the rolled out dough in the freezer briefly before cutting the cookies (your dough will be firmer and won’t bend or tear when you move the cookies to the baking sheet). 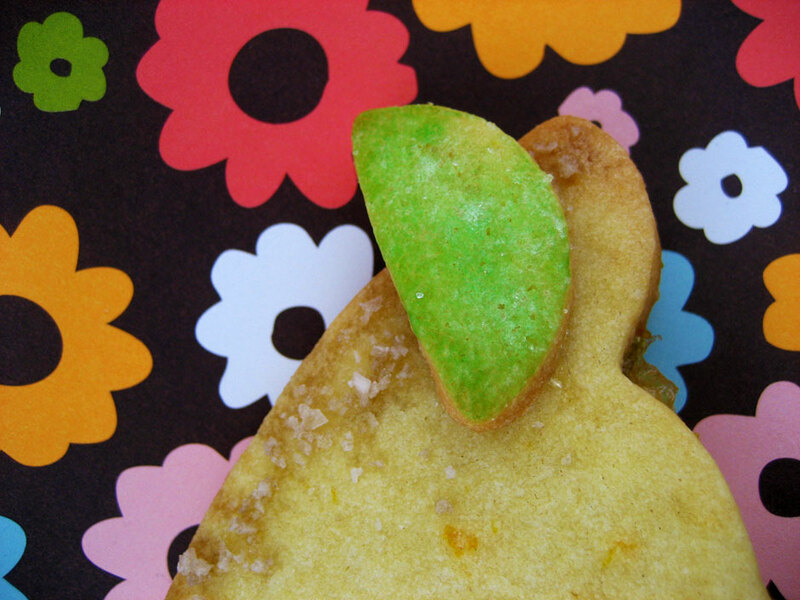 For every 2 Margarita cookies you cut out, cut out one half-moon shape and brush it lightly with food coloring (diluted with water if it’s very dark). Bake on a lined baking sheet for about 10 minutes, until very lightly browned around the edges. Allow to cool on the sheet for a minute before transferring to a rack. Cool completely before assembling. 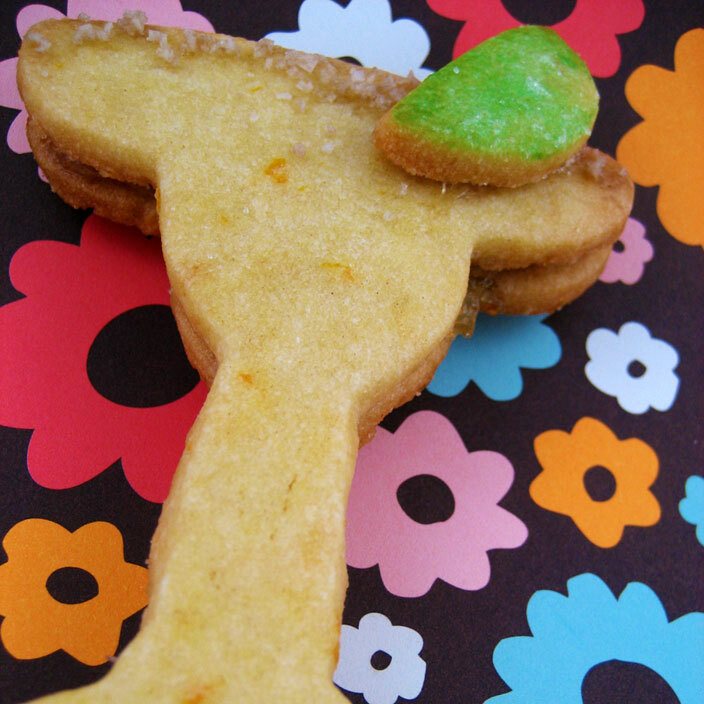 Spread a layer of marmalade on half of the Margarita cookies and sandwich with the other half. Chill for a little while to allow the marmalade to set back up so the cookies don’t shift around on top of each other. Brush a small amount of agave nectar along the “rim” of the cookies and sprinkle with salt crystals, making sure to press them in slightly. 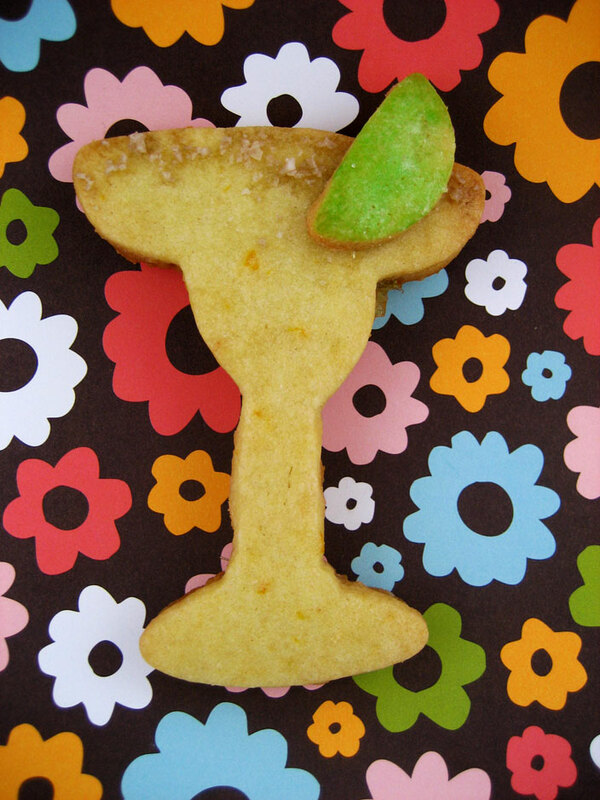 Add a small amount of marmalade to the backs of the lime cookies and stick them onto the “glasses” to complete the Margarita cookie experience. Though they ended up being slightly belated (oh, work) these cookies were VERY well-received, and totally delicious. Plus, as I pointed out in the accompanying note I sent along, belated birthday presents are actually great – you get to stretch out the potential gift-getting timespan!